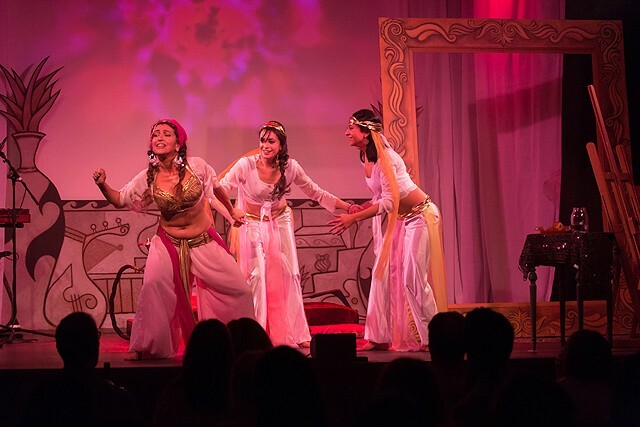 This section presents Raqsarabia photos, videos and press releases showing Carmen in costume, performing with Mazaj and others, and presenting Arabic Dance workshops. There is something rather special about a trip to a theatre show; whether a musical, drama or comedy, live theatre has a unique way of capturing an audience's imagination with its lights, live performance and unfolding story. 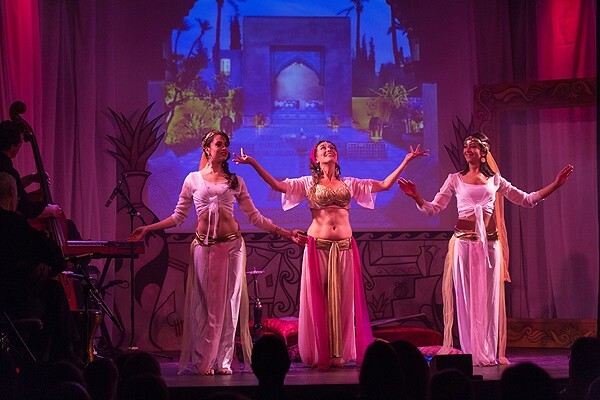 Marry live theatre inspired by tales from the Middle East with belly dance and the resulting production is an enchanting treat for all the senses! 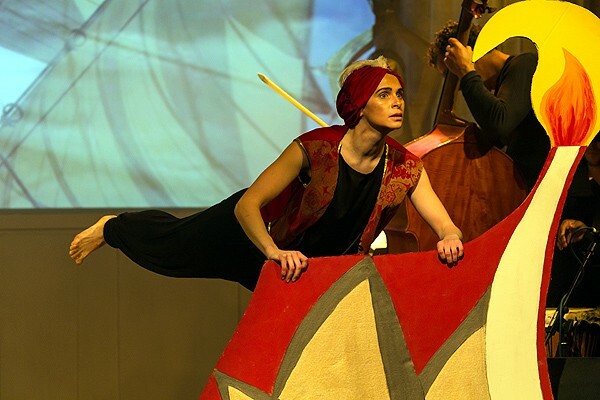 On this occasion, the audience were invited to share in the magical tale of "JULNAH OF THE SEA"; a story of love, loss and reunion as told through dance, multimedia and narration. 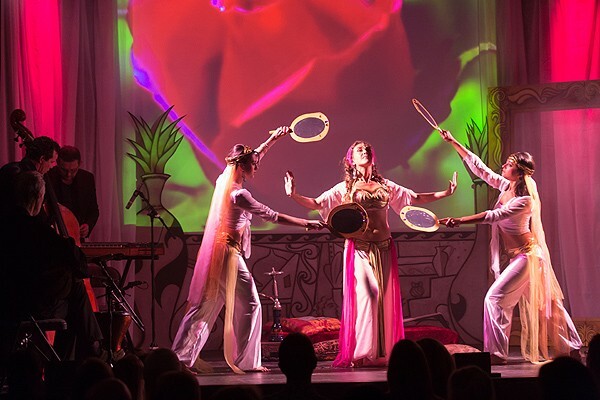 Presented and created by Bath-based international dance artist Carmen Jones with Club Cairo, "Julnah of the Sea" combines a variety of dance styles from traditional Egyptian belly dance through contemporary dance and ballet. 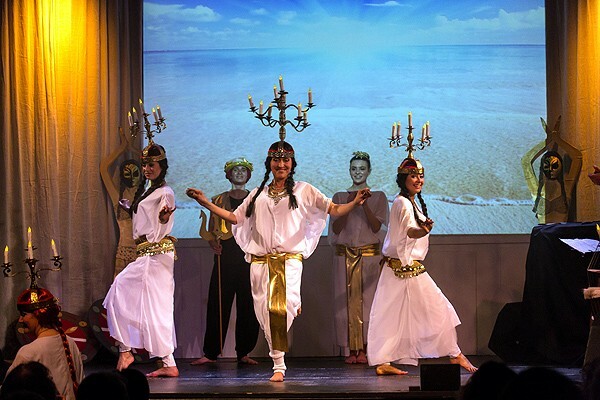 The show is performed by a talented chorus of dancers and accompanied by the best of traditional and contemporary live music, courtesy of the group Hazir. The show has so far successfully toured throughout the UK over the course of 2015/16, playing in theatres in Bath, Brighton, London, Birmingham and Newport. 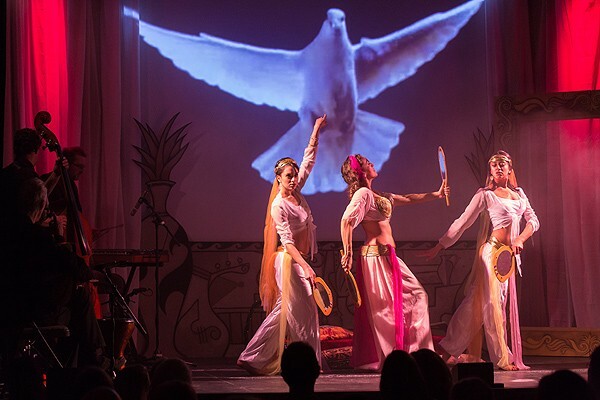 Opening the tale with a compelling and engaging narrative, the audience were immediately transported to a far away kingdom, enhanced by clever use of multi-media back drops, lighting and atmospheric music. 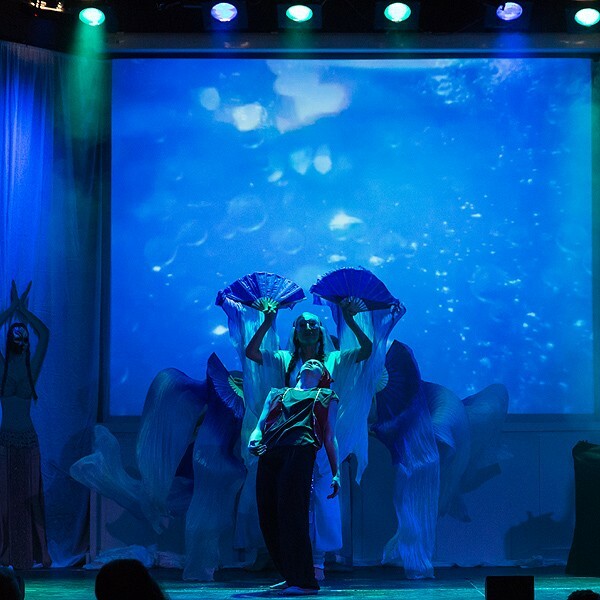 This was put to particularly good effect during the "water scene" when dancers, musicians, lighting and multi-media combined to figuratively wash the audience under the waves and into the watery depths of the ocean! This created the perfect metaphor for the entire show with each scene smoothly undulating to the next, not unlike the dance itself. 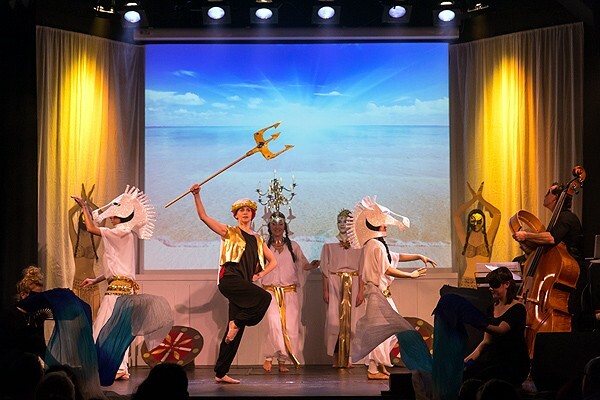 Effective use of a narrator between scenes ensured the audience were continually engaged with the tale and dancers further involved the audience as they paraded down the isles at pivotal moments throughout the story. 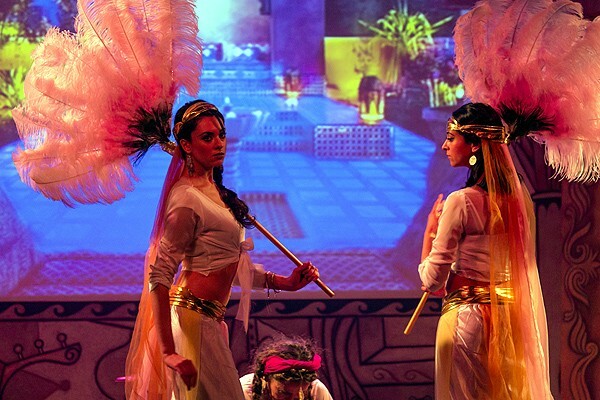 The dancers themselves took on a myriad of roles and were highly adept at portraying the tale through the medium of dance, including traditional dances such as the Zaffa march during the wedding scene. 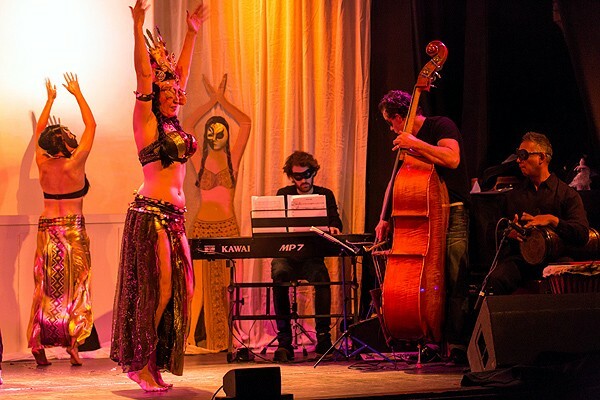 Throughout, the dancers were skilfully accompanied by the potent music of the live band. Complementing the show, the second half included performances by respected and highly regarded dancers from across the UK. 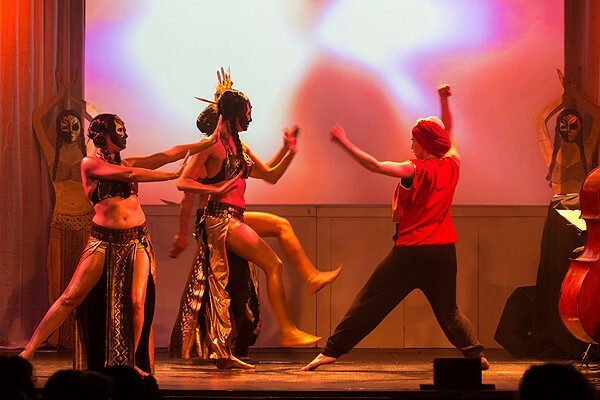 They presented classic belly dance renditions alongside the musicians and dancers from the main cast. 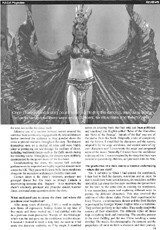 In an interview, the show's visionary, producer and principal dancer, Carmen Jones, answered some questions about the show. What motivated you to create the show and where did you draw your inspiration? After many years of dancing, I felt a need to explore new forms of expression. Adding theatre to my love of live music and dance excited me. I had dabbled with this in a previous short production "Escape of the Odalisque" which was fun and gave me the confidence to delve deeper. I decided I wanted to retell a fairy tale. As soon as I had made this decision, suddenly, as if by magic, I stumbled across an amazing book that had only just been published and translated into English called "Tales of the Marvellous and News of the Strange". 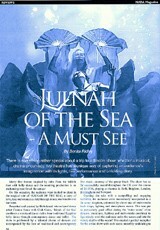 "Julnah of the Sea" was one of the stories from this book. Originally a tale of complexity and the bizarre, I simplified the characters and the scenes, adapted it for the stage and dance, and created some of my own characters too! I even wrote the script and composed some of the music. Normally I'd never have the confidence to do any of this. I was so inspired by the story that there was no time to question my abilities, so I just went with the flow. The production of a show can be a massive undertaking - where did you start? Yes, it certainly is. Once I had created a story board I then had to find the dancers, musicians and an actor. In fact in total there were seven dancers, six musicians and the storyteller. Let alone the five crew members that joined later for the tour. At the same time as creating the storyboard, I was researching music and exploring different ways to portray the different characters. This also involved the addition of other dance styles. 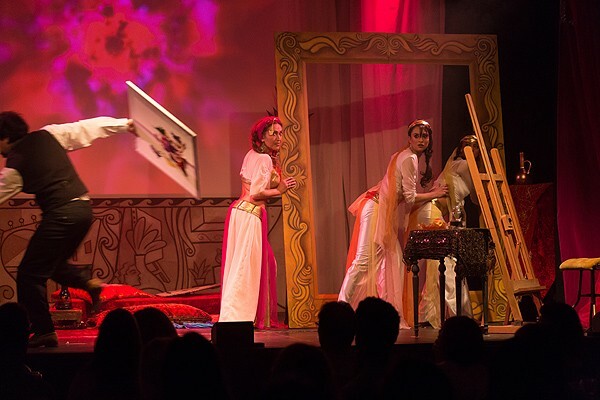 Prince Badr is portrayed by Lucy Thynne, a contemporary dancer and the Bird Maiden is portrayed by Georgie Wynne Hughes who is a ballerina. They worked perfectly in their roles. They really caught the essence of their characters. The different styles of dance kept everything fresh and interesting. The creative process is the most thrilling part for me. I love watching a scene develop. The music, the choreography, the costume and the projections all unite to form a character and their journey. Even though challenging, it was exciting at the same time. What challenges did you face taking a show on tour? Some of the biggest challenges for me were coordinating such a large group of people, finding the right venues with the correct specifications and keeping up with all the publicity. The hours spent on the computer were pretty gruelling. I'm not really very computer literate so found that extra hard. How did you go about assembling your cast, musicians and crew? This was easy, I knew them all already! I've been very lucky to know and work with such talented people on and off over the years. Not only are they highly skilled and reliable but they're a great bunch to hang out with too. Whether on the stage or behind the scenes, we all depend on each other. So being a team player is a very important quality to posses. What has been the highlight of your tour so far? There is no "one" particular highlight because there are so many. It's only now that I can sit back and digest all that has happened. I feel a wonderful glow of pride and joy that we travelled the country having shared our production with audiences that really appreciated it and all our efforts. That's a major high and means the world to me. What is your favourite piece from the show? I think visually the Underwater scene works a treat. The projections combined with the music and the fan veils are just lovely. I was really proud of this one. 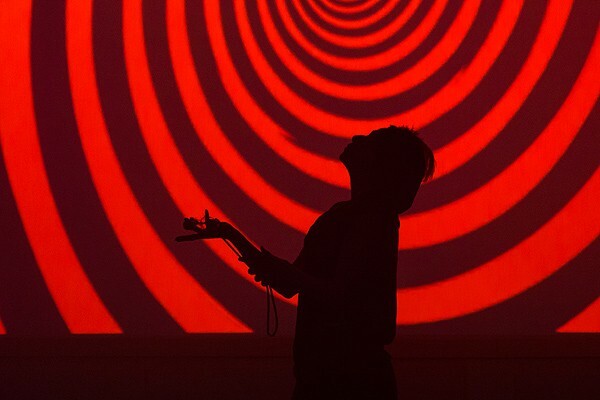 In fact, the projection art in our show is of the utmost importance. It adds further dimension, colour and expression to each scene, enhancing the storyline and characters. What advice would you offer to anyone thinking of producing a show of their own? Do it! It's an amazing experience. You will learn so much. I've tried to embrace every challenge that has come my way and I've found a way to resolve each of them (eventually). It's exhausting, frustrating at times, financially depleting but hey, you only live once. Make your dreams come true! What can we expect next from Carmen Jones and Club Cairo? We have one more show on 15th October at The Zion Theatre (Z-ARTS), 335 Stretford Road, Hulme, Manchester M15 5ZA. However Club Cairo will be back on tour Spring '17 with a new production. Watch this space! 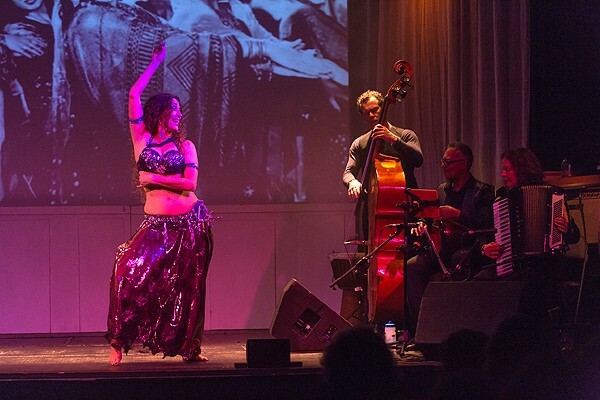 It is always a treat to watch live music and dance - especially belly dance! But particularly when portrayed with high regard for the beauty of the art that it is; celebrating some of the finest dance and music from the UK belly dance community and presented in a highly polished production, "Julnah of the Sea" becomes "A Must See!" 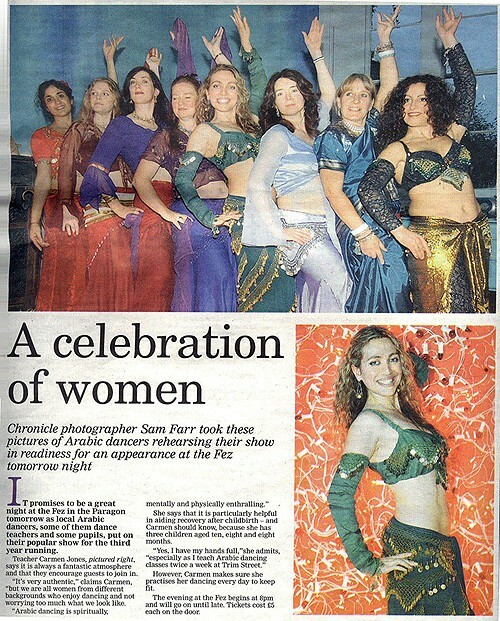 Chronicle photographer Sam Farr took these pictures of Arabic dancers rehearsing their show in readiness for an appearance at the Fez tomorrow night. 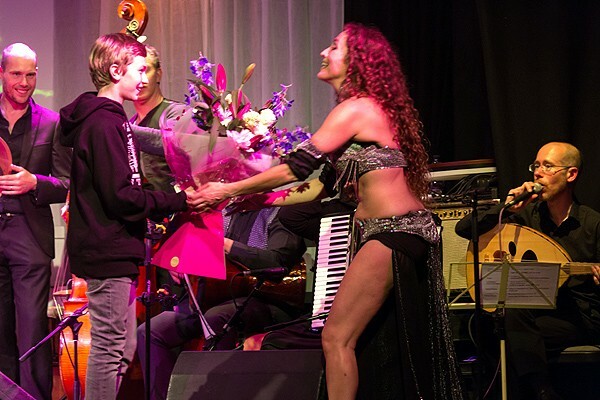 It promises to be a great night at the Fez in the Paragon tomorrow as local Arabic dancers, some of them dance teachers and some of them pupils, put on their popular show for the third year running. Teacher Carmen Jones, pictured right, it is always a fantastic atmosphere and that they encourage guests to join in. 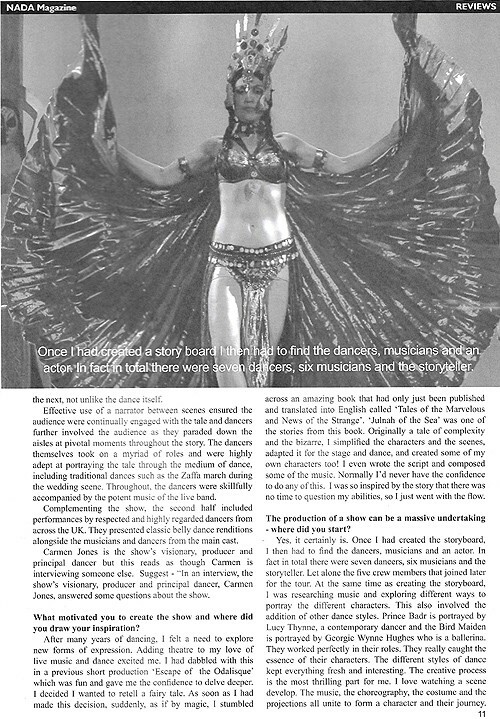 "It's very authentic", claims Carmen, "but we are all women from different backgrounds who enjoy dancing and not worrying too much what we look like". 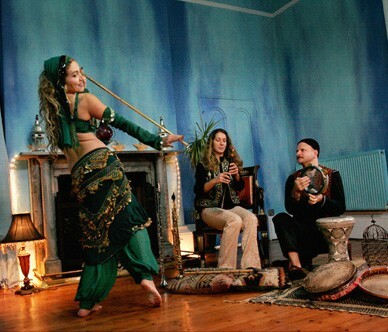 "Arabic dancing is spiritually, mentally and physically enthralling." She say's that it particularly helpful in aiding recovery after childbirth - and Carmen should know, because she has three children aged ten, eight and eight months. 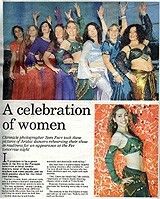 "Yes, I have my hands full", she admits, "especially as I teach Arabic dancing classes twice a week at Trim Street". However, Carmen makes sure she practices her dancing every day to keep fit. 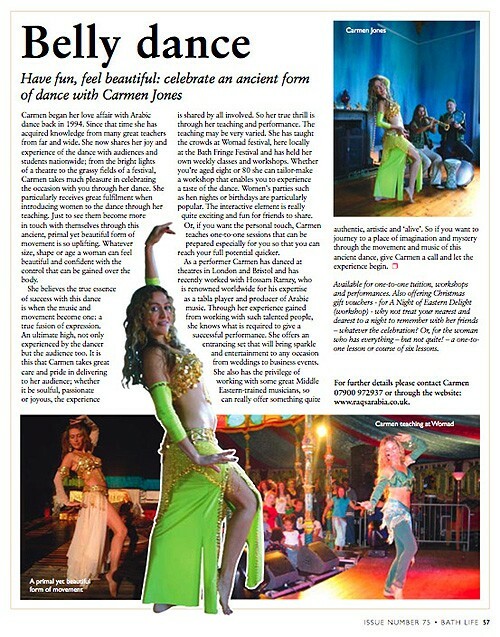 Carmen began her love affair with Arabic dance back in 1994. In that time she has acquired knowledge from many great teachers along the way from far and wide. She now shares her joy and experience of the dance with audiences and students nationwide; from the bright lights of a theatre to the grassy fields of a festival, Carmen takes much pleasure in celebrating the occasion with you through her dance. 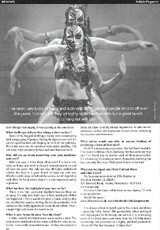 She particularly receives great fulfilment when introducing women to the dance through her teaching. Just to see them become more in touch with themselves through this ancient primal yet beautiful form of movement is so uplifting. Whatever size, shape or age a woman can feel beautiful and confident with the control that can be gained over the body. 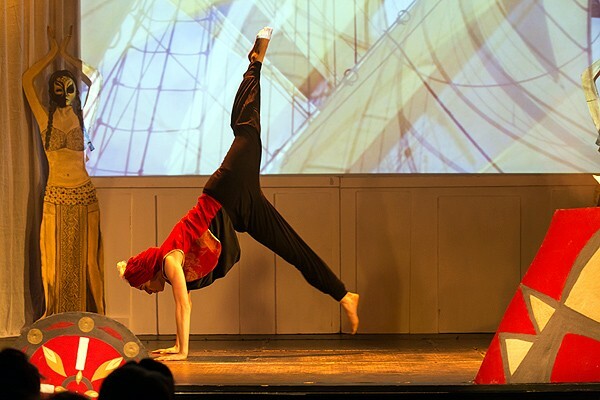 She believes the true essence of success with this dance is when the music and movement becomes one. "A true fusion of expression." An ultimate high, not only experienced by the dancer but the audience too. 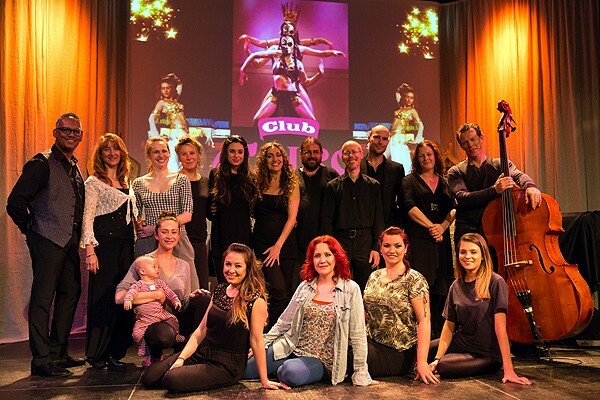 It is this that Carmen takes great care and pride in delivering to her audience whether it be soulful, passionate or joyous, the experience is shared by all involved. So her true thrill is through her teaching and performance. The teaching may be very varied. 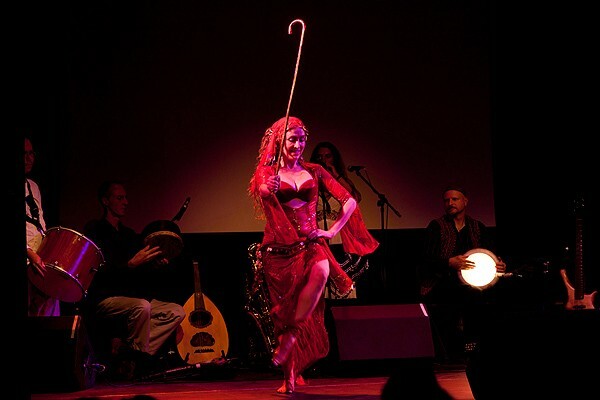 She has taught to the crowds at Womad festival, here locally at the Bath fringe festival and has held her own weekly classes and workshops. Whether you're aged 8 or 80 she can tailor make a workshop that enables you to experience a taste of the dance. Women's parties e.g. hen nights, birthdays are particularly popular. The interactive element is really quite exciting and fun for friends to share together. Or if you want the personal touch Carmen teaches one to one sessions that can be prepared especially for you so that you can reach your full potential quicker. 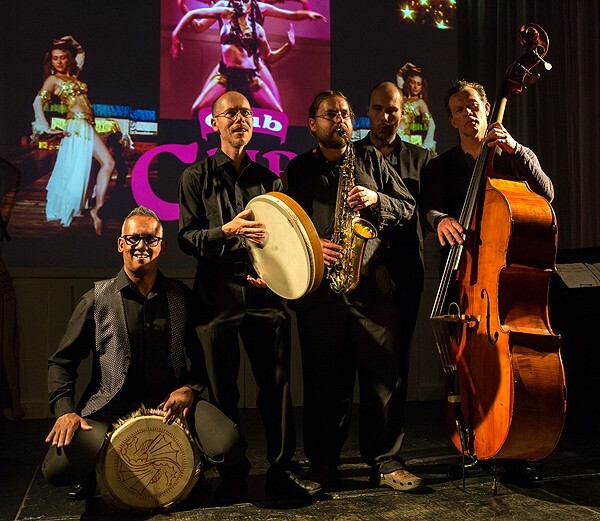 As a performer Carmen has danced at theatres in London and Bristol and has recently worked with Hossam Ramzy, who is renowned worldwide for his expertise as a tabla player and producer of Arabic music. Through her experience gained from working with such talented people she is very aware of what is required to give a successful performance. She offers an entrancing set that will bring sparkle and entertainment to any occasion from wedding parties to business events. 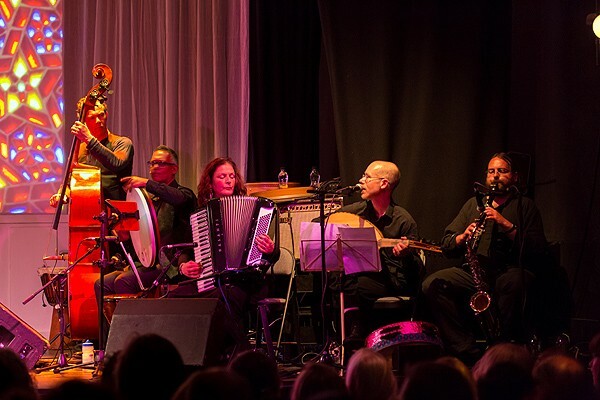 She also has the privilege of working with some great Middle eastern trained musicians, so can really offer something quite authentic, artistic and "alive". 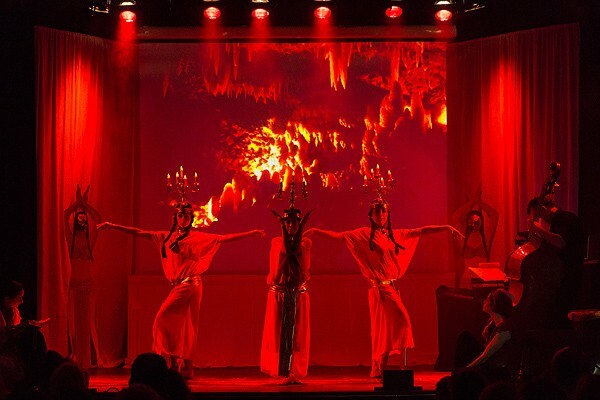 So, if you want to journey to a place of imagination and mystery through the movement and music of this ancient dance, give Carmen a call and let the experience begin.